The Spanish regional and local elections have sent shockwaves through the country. What happens now? 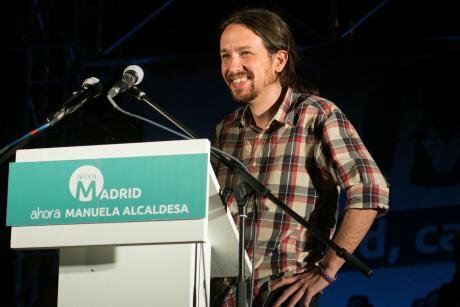 Pablo Iglesias lends his support to the Ahora Madrid party in Spain's capital. Demotix/Marcos del Mazo. Some rights reserved.Spain went to the polls yesterday in municipal and regional elections that are not only important in their own right, but which will heavily influence the general elections later this year. The Spanish people have sent a very clear message: against the traditional parties, against the “business as usual” attitude of the political bosses, against government by majority decree, against austerity and the growing marginalization of the poor. It was a good day for democracy overall. Between them, the traditional mainstream parties managed to lose 3 million votes out of 14 million cast. The main loser was the governing Partido Popular, losing 2.3 million votes from their previous performance in 2011. While still the most voted party over all, the Populares have lost their majorities in every community and are positioned to lose a number of key cities and regions, including Madrid metro and Valencia. The Galician PP also suffered defeats to leftist and regionalist parties in what is a personal blow to Prime Minister Mariano Rajoy who is a Galician from Santiago de Compostela. The Socialist Party (PSOE) continues to shed votes, but has perhaps halted its slide to irrelevance, losing 700,000 votes from 2011, which was already a low point, but maintaining itself as the second most voted party in Spain. They Socialists also made important gains in Andalucia (Seville), Asturias and Extremadura. The PSOE is not in any position to be king, but they could be kingmakers in a number of potential leftist coalitions. Podemos continued to consolidate itself as a viable political alternative on the left. Podemos has not been able to maintain its meteoric performance from last year’s European elections, but their performance in Madrid, Barcelona and Zaragoza, where Podemos acted as an umbrella organization supporting independent leftists Manuela Carmena and Ada Colau to victory. The party of Pablo Iglesias performed less well at the regional level. The right’s answer to Podemos is Cuidadanos (Citizens’ Party), led by Albert Rivera. From being a purely Catalan party, Cuidadanos has successfully leveraged the dismay of the average conservative voter, who can’t stand the corruption and arrogance of the Populares, but can’t bring themselves to vote for the PSOE or Podemos. Cuidadanos secured a very respectable 1.4 million votes, holds the key to a continuation of Popular rule in a number of cities and regions. The previous generation of “alternative parties” was crushed by the good performance of their newer competitors. Izquierda Unida (United Left) lost one-third of its support and falls to fourth place overall with no options to govern anywhere. Rosa Diez’s UPyD (Union, Progress and Democracy) essentially ceased to exist, which as the logical outcome of Ms. Diez’s intransigence in the face of her party’s poor performance in the recent elections in Andalucía. In Catalonia, the pro-independence parties CiU, ERC and CUP consolidated their position in the provinces, but lost the critical fight for Barcelona to a Podemos-backed Barcelona en Comú (Barcelona in Common). This will have important implications for the “path to independence” and the proposed early regional elections set for 27 September of this year. On the other hand, the PPC and PSC – the Catalan branches of the Populares and Socialists respectively, practically ceased to exist. Analysts and pundits will have a full schedule over the coming weeks in what promises to be a very busy summer for Spanish politics. The May elections included votes for 13 regional parliaments and for cities across every province of Spain. Turnout was somewhat low, higher only than the 2007 elections. The Partido Popular is sure to make mention of this turnout and claim all 4% of the stay-at-homes as conservative voters, but there is no basis for making this claim and even if true, it would be an indication of disgruntlement with the current leadership that wouldn’t bode well for the upcoming general elections. The 6 million ballots cast for the Populares is a loss of 2.5 million votes and the worst performance for the conservatives in more than two decades. The Populares remained the most voted party in most of the Spanish communities, remaining the most voted party in 10 of the 13 autonomous regions that held elections. In fact, they only lost their plurality in Extremadura and the Canary Islands. Yet Spain’s proportional system means that the Populares might actual go into opposition in three more regions due to possible coalitions of left-wing parties. More importantly, the conservatives have lost their absolute majority in over 500 localities in Spain during this election – though still retaining 2,700. Yet among the 500 lost are all of the provincial and regional capitals, including some cities where they have dominated for decades, like Madrid and Valencia. The Spanish Socialist party appeared pleased with the result; leader Pedro Sánchez crowed that the socialists had managed to greatly narrow the lead enjoyed by their conservative rivals. That is true: but it is due more to the fact of their collapse than any great merit on the side of the PSOE, which lost an additional 700,000 votes. The best that could be said of Mr. Sánchez’s efforts is that they have stopped the most obvious hemorrhaging, but the patient remains in critical condition. Neither the conservatives and the socialists are able to decide their own fates, the both depend on coalitions in order to form governments across most regions and cities. The Populares now depend on Ciudadanos to retain control of the autonomous communities of Madrid, Cantabria, La Rioja, Murcia and Castilla y León. The Socialists similarly need to make deals with Podemos to govern in Extremadura, Castilla-La Mancha, and Asturias; while in Valencia and Aragón the Socialists would also have to deal with Compromís and the Partido Aragones, respectively. The Socialists may have the easier time of it. “There are no enemies on the left,” it was once said; and while that is no longer true given the cutting attacks launched by the left-wing parties against each other, it remains certain that they all want to cut the conservatives down to size. They might find it easier to make compromises as well since most of the most visible leaders of the PSOE from the Zapatero days have long ago been sacked; there is much less baggage to carry. - The resignation of anyone accused of corruption until their innocence is demonstrated. - Financial responsibility of the party should its officials be convicted of corruption charges. - Reform campaign finance laws to prohibit corporate donations, reduce private donations, and prohibit bank loans to the parties. - Require all political parties to make their accounts completely public. - Election of party delegates through an open primary system. Mr. Rivera might as well ask the Populares to vote a monument to Karl Marx. Ada Colau. Demotix/Brais G. Rouco. All rights reserved. Catalonia is indeed different, and often out of sync with the rest of Spain, but last night the ruling CiU party suffered many of the same ills as the Partido Popular. CiU Artur Mas had made retaining control of Barcelona the centerpiece of this party’s electoral efforts, but notwithstanding this, the incumbent Xavier Trias lost to the Podemos-backed candidate, Ada Colau of Barcelona en Comú. Barcelona will have a female mayor for the first time in the city’s history, but more importantly, Podemos has demonstrated that it can make major inroads into the “nationalist” territory of Catalonia. Ciudadanos, which was born in Catalonia as a “third way” between nationalism and the existing two-party monopoly in Spain, also did well going from 1.2% of the vote in 2011 to 7.1% yesterday. Thus the “new insurgent” parties have proven that Catalonia is not so out of sync as many might have thought and that Catalan nationalism is not the only way to win votes in that region. The bad news for Artur Mas continued: although his party did well in the smaller and rural municipalities, it was a very tough night for CiU. They only managed to retain control of one provincial capital (Girona) while their steady erosion of votes continued with the loss of another 110,000 supporters. CiU finds itself in an uncomfortable position: right in the middle. And it’s electoral room for maneuver is shrinking alarmingly. It is not pro-independence enough, so the most ardent supporters of Catalan independence vote for ERC or CUP, who won to 16.4% and 7.1% of the vote respectively. In fact, ERC + CUP polled 110,000 more votes than CiU, versus just half as many as CiU 4 years ago. Yet CiU is also too centrist and moderate to gain votes on the left, which explains the debacle in Barcelona with Ada Colau and the shocking growth of CUP. Even the Catalan Socialists managed to win in the capitals of Lleida and Tarragona, though still losing 200,000 votes. The overwhelming reaction to the electoral results in Catalonia has been to assert that “independence has been dealt a body blow”. 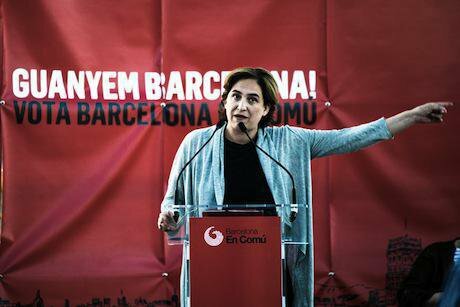 It is true that the path to independence looks impossible without Barcelona, and Ada Colau is not pro-independence. Yet the electoral results show that the pro-independence parties (ERC, CUP, ICV-EUIA) gained half a million votes, while the pro-union parties (PSC, PPC, C’s) lost 128,000 votes, despite the strong showing of Ciutadens. Even placing CiU in the pro-independence column, the net gain for the independence parties was 423,000 votes. That hardly sounds like a crisis. Although the independence process has not been dealt a death blow – that is merely wishful thinking on the part of Spain’s newspapers – it is nevertheless legitimate to question whether the de facto Catalan referendum in the guise of regional elections should not be delayed until after the general elections. The loss of an absolute majority is almost guaranteed; and a PSOE-Podemos coalition of the left might become a reality if they are able to cooperate and govern at the municipal and provincial levels. That would change the calculus for CiU radically: Mr. Mas might be able to negotiate and deliver on a degree of decentralization that would satisfy a majority of Catalans and preserve both the unity of the country as well as the CiU’s leadership of the autonomous region. And in the event of a Partido Popular victory or a coalition with Ciudadanos, what has been lost be a few more months? The disappointment of another conservative legislature might be the boost that independence has needed since its apogee on 9N2014. Cassandra was a Greek girl who was cursed by the gods; she was condemned to have the gift of prophecy and to always speak the truth, but to never be believed. Like Cassandra, the Partido Popular has been told the truth by the Spanish people: enough is enough. No more corruption, no more business as usual, no more governing for the rich and the Germans. Whether they hear that message, or prefer to remain complacently as the “most voted party”, will largely determine the outcome of the upcoming general election this year. The conservatives still have a large base of supporters, plenty of people who simply will not vote for a party on the left; but they are squandering their loyalty through arrogance and obstinacy. Given the initial response given by the party’s spokesman this morning, and the press conference this afternoon by Prime Minister Rajoy, it seems that the initial reaction is more of the “head in the sand” politics that has always characterized the Galician’s leadership style. He has declared victory, announced that there will be no reshuffling of his government, and vowed to continue on course – a course the Spanish people have just repudiated. This bodes ill for the PP’s electoral fortunes. Germany: take notice. You might soon lose Spain as well as Greece. As opposed to the Province of Madrid, where they may retain the government if they are able to make a pact with Ciudadanos (Citizens). Judge Manuela Carmena will need support from the Socialist Party to become Mayor of Madrid. The Populares Esperanza Aguirre has one more seat, but her path to a majority coalition is far more difficult than Ms. Carmena’s. Candidatura d’Unitat Popular, or Popular Unity Candidates, is a left-wing pro-independence party in Catalonia, very similar ideologically to the Esquerra Republicana de Catalunya. Ms. Colau appears to support the right of the Catalans to decide their own system of government, but is not in favor of secession. Ciutadens went from 35,000 votes to 230,000 votes.